Over the next few posts I’ll be talking about how we went about building an autonomous race car for the DIY Robocar Races. We’ll start with a hardware overview. For a chassis we built on the Traxxas Slash frame. It satisfied the race’s 1/10th scale requirement and is built to be raced. 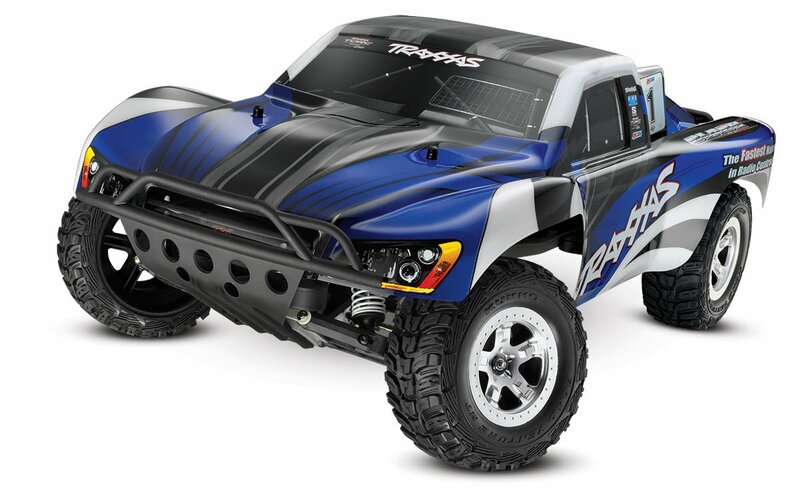 This vehicle, like most 1/10th Traxxas designs also provided us with a large platform to mount all our modifications including the extra battery for the control system. We’ve taken off the plastic shell, removed the motor controller antenna module, and used the Traxxas provided plastic spacers to adjust the suspension springs for optimized concrete track performance. To eliminate any risk of a voltage spike from the motor/inverter system damaging the on board electronics we’ve opted to install a separate 4000mAh battery to power the dev board and all associated electronics. We’re mounting the extra battery using mushroom cap connector tape since we want to be able to easily swap in a new battery if one unexpectedly approaches end of life conditions such as swelling up perpetually in a cold state. The Poulu Micro Maestro – visible in the lower left of the above image – is a handy servo motor controller board which interfaces easily with the Traxxas drive and steering control system. Since it can be USB controlled we can manage the controller off of the USB splitter mounted under the car. We used dual lock fastening tape to mount the USB splitter to the underside of the chassis giving us a convenient location to plug in peripheral USB devices such as the Micro-Maestro, the camera, keyboard or mouse bluetooth dongles, or a storage device. Our main computing solution is an NVidea TX1 mounted on the Jetson development board. This GPU has significantly more processing power than needed for our current architecture but it gives us lots of room to grow as we will likely want to run multiple models simultaneously as we add to the project. Nice things on the TX1 Jetson dev board that we will want to make use of include generous GPIO headers, HDMI, USB, microUSB, SD card adapter, Ethernet, Blue Tooth, and the serial display connector. The TX1 dev board is mounted on metal standoffs from same pack as were used to mount the Micro Maestro. To get enough clearance for the batteries we had to stack two standoffs but they screw together nicely. The Camera and inertial measurement unit (IMU) have been mounted together on top of the 3d printed pylon and mounting bracket components (IMU is mounted on the back of the plate). Landing holes for the TX1 Wifi Antenna bracket have also been included on the mounting pylon. The mounting components were designed in OnShape and can be found here. Future blogposts will discuss in detail the design of our camera mounting pylon and those mysterious white stripes which are painted on the front wheels.